The match had been hyped to its highest peak. It was seen as the real test for the “Chosen One” and the stage was set for “the babies” to be slaughtered and a chance to land a major blow to “the best manager” in recent times (according to the protagonist himself) and “prove why he is the right person for the job” as he wrote in his match day program. If there was a match where people were so keen to see the starting lineup for both sides, it was Monday night’s clash between Manchester United and Chelsea. The Wayne Rooney conundrum, will he play or will he not? 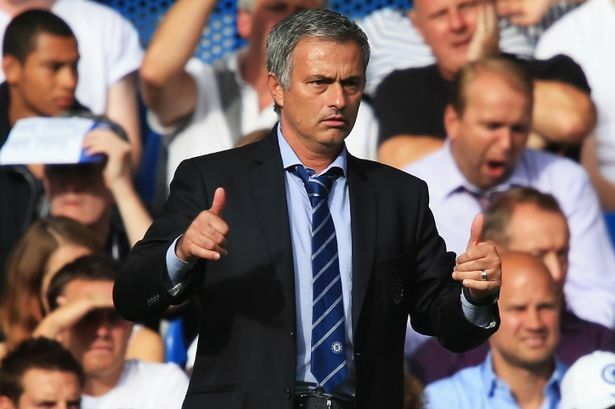 How is Jose Mourinho going to approach the match tactically? Who leads Chelsea’s attacking team? There was so much at stake that the countdown to the match started the moment the FA released the fixtures for the season. United lined up their strongest 11 players available and it included the controversial Wayne Rooney. However to the utter amazement of many, with the plethora of strikers (3) Chelsea have there was none Chosen; and as if that was not enough, Chelsea’s 2 times best player of the season winner who had featured in the previous match had no place in the team! There and then, as I found it surprising and difficult to swallow, I just said to myself, “it’s Jose, what else matters” which follows our Adidas Kit launch slogan, “It’s Blue, what else Matters”. Indeed, as the game later showed, nothing mattered. And it applies to what has gone on so far in the transfer market as to which players we are signing Including the season ahead of us. We have doubted many of our coaches but I think Jose has proven himself enough to be trusted with making his own decisions, besides, “he is one of us” and he won’t do something that will hurt the club he loves, works for, and supports as a fan. So, when the going gets tough, remember, “It’s Jose, What Else Matters”. The “babies” will one day grow to become men. Just as the season was touted to be one of the most competitive due to several reasons, it is truly living, even above that billing. The various managerial shake up at the top, the retirement of Ferguson and which manager steps in his role in EPL, the coming in of the Financial Fair Play rules and clubs fighting to get into the lucrative Champions League spots to cushion their finances, all these have made the transfer Window become very hot and it’s impact on the League will be experienced later. So far, the club with the loudest noise in the market (apart from Manchester City) has been Tottenham Hotspurs who want to buy every player in the market. After securing Soldado, Paulinho, Chadli, Capoue, Chiriches, they nearly snatched away Willian from the claws of Liverpool had it not been Chelsea who made sure that some justice was served. After winning The Gareth Bale gazillion pounds jackpot from The only club who enjoy paying gazillions for 1 season wonder players (Real Madrid), Tottenham have enjoyed this unconventional means of financial doping to the disadvantage of their rivals in the EPL and seem to have punched above their usual weight in the transfer market. Arsenal, Chelsea and Manchester United who qualified to play the Champions League are yet to match the expenditure of Spurs. On a Thursday a Thursday as Spurs had travelled to play Their Europa Cup with Timbuktu 11 or whatever, Chelsea and Roman reminded them how traveling on Thursdays to play a Europa match could be dangerous by whisking away their much publicized Willian deal and his medicals being held amid pump and pageantry. At least Jose Chose to offer them a free advice as to how to conduct a peaceful transfer business during his prematch Conference. Hey Spurs, next time conduct player medicals in secrecy! Else, Chelsea will turn your headquarters to it’s medicals centre for its prospective signings. Anyway lets thank them for the flight and hotel cost they paid for Willian, but in case they throw away all the Gareth Bale jackpot into the market and they need their money from Willian, well, they shouldn’t hesitate to call Roman, he is a really nice person and not as stingy as their man, you know? When you meet Pellegrini, please tell him he is welcomed to the Premier League, it is a League you can’t use over 97 points to get second position. And the next time he is playing in Europe, he should psyche his boys up, as they are not used to winning important matches outside England. In fact, it was one of the key reasons why his predecessor got the boot and he could be no different. Anyway, congrats to Cardiff for bringing back the feeling of EPL and putting smiles in the faces of their passionate fans in Wales. It was certainly one of the good advertisement for the Premier League. Now that Wayne Rooney has not backed his words with actions by coming out openly to tell what he wants or hand in a transfer request, it’s clear that the Chelsea bus has gone as Jose’s 48 hours ultimatum did not elapse before the media through whom Rooney has been using or hiding behind came to say he was staying. Maybe he will or he may still be in his state of “confusion” and it’s good we live him in that state for him to continue working for RVP to get the honors whiles in secrete, the fans know he is nothing but a disloyal scouser who they are supporting out of convenience and nothing more. Perhaps he would have been a good addition to our attacking force but maybe he would have been such a bad influence on our “babies”. It is only good that Jose has indicated he has other options and he would sign our next target. Many names have been thrown about with Etoo being the one who many of the jury have settled on but once again, lets see, after the “medicals” of that player has been duly conducted in “secrecy” and confirmed, we will talk about it. But whatever it is, whoever we sign, the current team has clearly demonstrated that they are well up for the battle. The likes of Oscar who is becoming the heart of Jose’s team, De Bruyne, Schurrle and the rest of the babies went to the home of the Champions, in front of an intimidating crowd, taking bloody punches from opponents(RVP-Debruyne) and still, they stood firm, they fought as men and went back to London with a point. They will use that as experience and build upon it, that, not even the Champions who stretched us by 15 points last season can defeat them at Old Trafford. The signs are good, but remember, IT’S JOSE, WHAT ELSE MATTERS. Incisive, refreshing, and educating, love your write up bro. It’s azonto epistles what else matter? hey seth, infact i can emfactically say i’m proud to be Ghanaian and chelsea fan as well i enjoy every part of your”azontos” and i cant wait for more…ktffh…eye ogya!! !